It’s splat or be splatted once again, as Splatoon 2 unleashes ink-based warfare on Nintendo Switch for the first time. 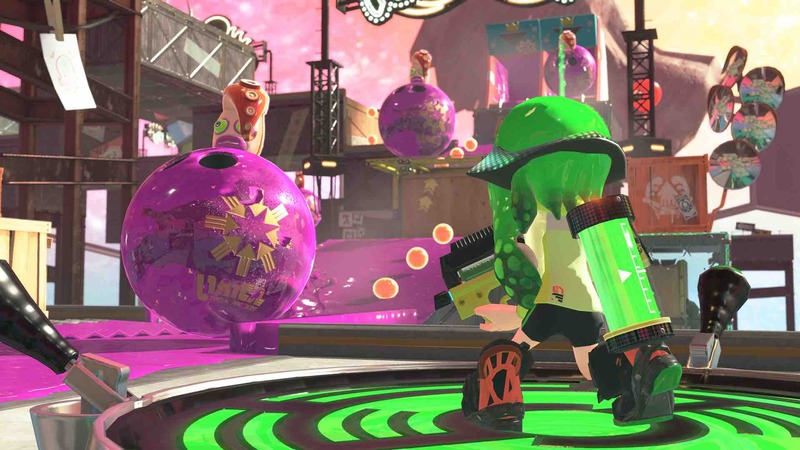 After Splatoon taught us how important it was to stay fresh, this sequel keeps things off the hook to build on its predecessor in nearly every way possible. It has been two years since the events that we saw unfold in the Wii U exclusive, and the action relocates to Inkpolis Square – two subway stations away from Splatoon‘s Inkopolis Plaza. This livelier area is still all about staying fresh but has similarly been wracked with a catastrophe. It is down to Off the Hook hosts Pearl and Marina to fill you in, revealing that the Great Zapfish that powers Inkopolis Square has been squid-napped by the Octarians and Squid Sisters pop superstar Callie has gone missing. As your customisable Inkling first wanders into the new nerve centre of Inkling culture, players are briefly introduced to their neon-infused surroundings: Deca Tower stands as one of the tallest buildings in all of Inkopolis and is where players will sign up to take part in online battles; Galleria is where you can exchange your hard-earned cash for new weapons, headgear, clothing and shoes, but only once you show the shop owners that you are fresh enough; The Shoal will let you hook up with other players locally for competitive and cooperative play; and a giant amiibo box will let you scan in your collection. For most, it will be the single player Hero Mode that will be a good starting point. This can be found by entering a sewer to reach Octo Valley, after following Marie from the Squid Sisters who soon recruits you into the New Squidbeak Splatoon – a secret society of heroes that save the world from the Octarians. Handed a brand-new Hero Suit as a signing bonus, you are tasked with recovering the Great Zapfish. 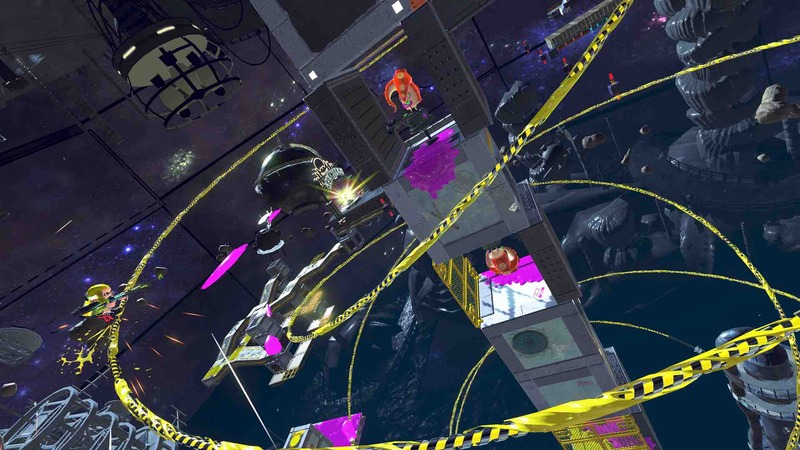 With your hunt starting in Tentakeel Outpost, as in Splatoon you will first have to discover and ink the invisible entrances to the Octarian realm in order to tackle each stage. This sees Octo Canyon quickly become a creative playground for Nintendo, familiarising players with the weapons and gameplay mechanics to help ease in newcomers before they face other Inklings online. Away from teaching you to ink turf and to enter squid form to swim and recover your ink supply, Hero Mode will see Sheldon from Ammo Knights ask for your help in testing new weapons that he is developing. The only weapon shop in Inkopolis with 542 million years of trusted service, this looks to introduce each weapon-type so that players can get a feel for which they prefer. When Hero Mode isn’t throwing familiar tricks at you such as Balloon Fish, Sponges, and Squee-G that were seen in Splatoon, it surprises and delights with dash tracks, ride rails, bounce pads, Grapplink points and switches that extend platforms for you to swim up, some of which have made it into the multiplayer arena. It’s clear that the developers have had even more fun designing wacky enemies, crazy stages and titanic boss battles, and it isn’t long before that inventive enthusiasm shines through – thanks in part to the wondrously glittery ink and deep fried squid rings that bask in Splatoon 2‘s neon glow. It won’t take you long to beat Hero Mode, but there are Sunken Scrolls and Sardinium to recover in each stage as well as commemorative souvenir stickers to collect in each Octo Canyon area. Sardinium is a material that can be used at the Ammo Knights Enhancifier, where you can improve your available weapons and unlock other types of bomb. This will let you stick to your favourites, as you can choose which weapon you want to use when you return to any completed stage. Sunken Scrolls, on the other hand, are slightly disappointing in comparison to Splatoon, revealing more about Inkling culture rather than expanding on the history of the mysterious species. Still, they are there waiting to be collected. Hero Mode can be seen as a distraction from the main event. Wander into the Lobby at Deca Tower, and, for those that spent countless hours playing Splatoon, the experience becomes all the more familiar. Here, heated four-on-four matches take place across Regular Battle, Ranked Battle and League Battle modes. Regular Battle sees Turf War as the main event, teams inking as much of the stage as they possibly can before the timer runs out – Judd and Li’l Judd passing judgement to decide who the winner is. Ranked Battle is for those that want a more competitive experience, seeing teams tackle Splat Zones, Tower Control and Rainmaker modes that are on rotation. While League Battle has evolved from Squad Battle in Splatoon, and will let you form a group of four players to compete against other squads in Ranked Battles. With map and mode rotation now two hours compared to four in Splatoon, the quicker cycle presents players with the potential for more variety, more often depending on how long their session lasts. It’s worth mentioning that you can join friends directly across all modes, queuing until space becomes available if their lobby is currently full. There is also the chance to organise a Private Battle, where players can invite friends and have the freedom to set the mode, stage and teams. The main weapons that you use in each mode will help lead you to victory, those that ink turf more quickly racking up more points in Turf War while more precise weapons lending a better chance at taking down your rival team in competitive play to present windows of opportunity. These are unlocked over time, requiring that players level up online before Sheldon will let you buy them. As before, these weapons come as fixed load outs – bundled with a sub-weapon and special weapon. Helping out with the grind are tickets collected in Hero Mode that you can hand over to Crusty Sean at his food van, exchanged for snacks and drinks that will increase your experience, cash or gear XP earned in a set number of online battles. Special weapons have been completely replaced – a Sunken Scroll blaming the overhaul on major changes to designer and manufacturer regulations. 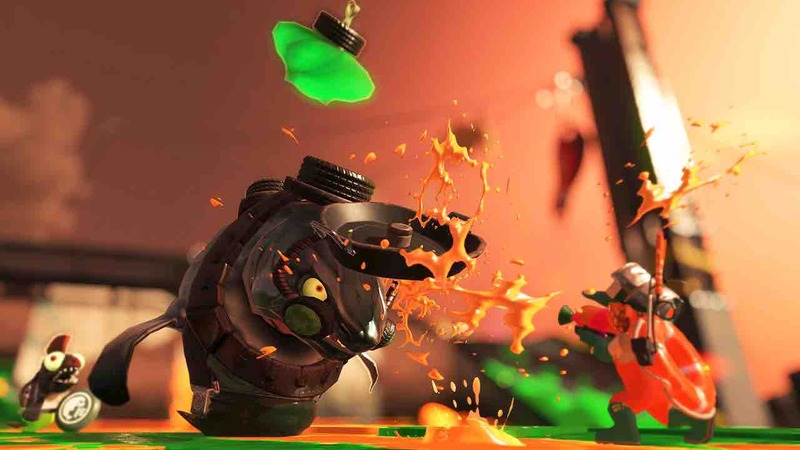 These now include the aerial Inket that lets you fire inky blasts from above, Splashdown that sees you slam the ground to unleash an ink wave around you, and Sting Ray, which unleashes a focused ink beam that can be fired through the terrain. Each has their strengths and weaknesses, and it is good to see Nintendo shake things up rather than sticking to those seen in Splatoon 2‘s predecessor. There’s also your gear to consider, with unlockable abilities that can help improve your performance in matches. This also lends more customisation over your Inkling’s appearance, meaning that you can keep your own style fresh compared to what other players are wearing. If you are looking for something to do in your down time, then look no further than Salmon Run. This is a hilarious and often tense cooperative experience that will see you work for a suspicious company called Grizzco Industries. This part-time job will see you contractually obligated to work as a team to take out waves of vicious, unfeeling Salmonids to earn as many Power Eggs as possible, keeping an eye out for Boss Salmonids that, once defeated, will let you harvest Golden Eggs. Grizzco, as a results-based organisation, requires that you meet a Golden Egg quota to pass each round, meaning that it is important that you take these straight back to the egg basket before losing them. With increasingly difficult rounds, Salmon Run soon becomes a highlight. It becomes all the more challenging when you realise that players are randomly equipped with one of four supplied weapons each round, with Nintendo throwing in other factors such as rising water levels, fog and glowflies that attract fast-moving Salmonid to a particular player to make the mode all the more challenging. 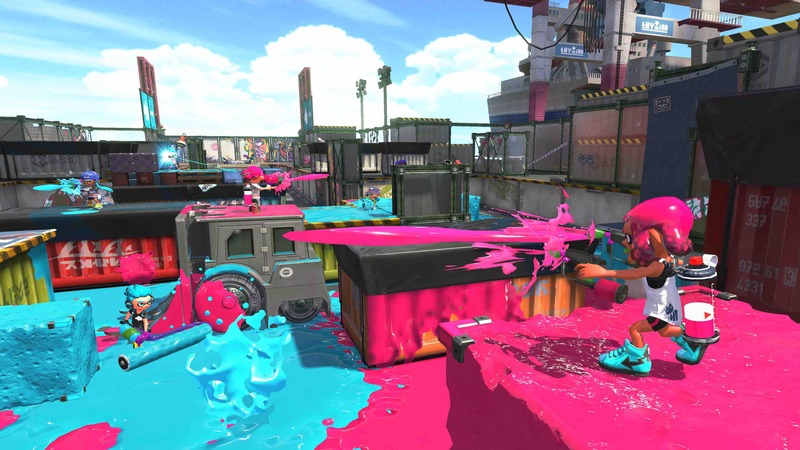 Players can be taken out, requiring that their teammates spray them with ink to revive them – as if your entire team gets wiped then your shift is cut short. The eight Boss Salmonid are particularly imaginative: the Stinger seeing a sniper sat on top of a stack of dirty cooking pots; Maws swimming in ink to chomp you from below; Steelhead lobbing bombs that you must shoot to kill it, and Drizzler hiding in a metallic umbrella before unleashing ink clouds. Alone they are easy to defeat, but Salmon Run will soon throw multiple Boss Salmonid at you to make your team’s survival all the more daunting. Success will see you earn Grizzco Points that are multiplied with your Job Score and Pay Grade, and, ultimately, will help your earn limited-time bonuses such as rare clothing and tickets. Salmon Run presents a sensational and manic experience, the mode’s only downside being that it can only be played in certain time windows. That is likely an effort to make more players check it out at the same time to quicken matchmaking, but it would be nice to dive into this more frequently. Clearly wanting you to splat anytime, anywhere, with anyone, Splatoon 2 supports TV Mode, Tabletop Mode and Handheld Mode, and can either be played online with friends and other players from around the world or locally with up to seven other players. Everyone will find their own preferred control method, but, whether playing with the Joy-Con Grip, Nintendo Switch Pro Controller or in Handheld Mode, you’ll spray ink in all directions thanks to motion control. What’s exciting is that this is just the start for Splatoon 2. 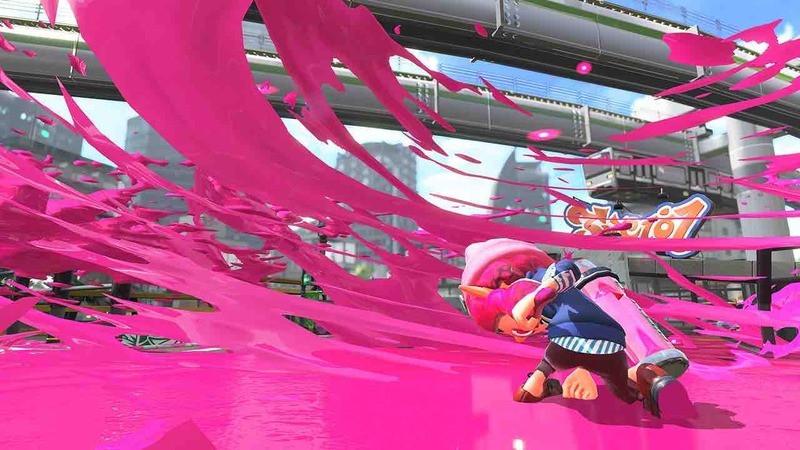 As with Splatoon, Nintendo has a roadmap to roll out updates for the game post-launch, that will introduce new weapons, gear and stages – the umbrella-shaped Brella weapon the first to be revealed. That the game arrives so early in the Nintendo Switch life means that the timing couldn’t be more perfect, delivering an unbeatable multiplayer experience that we’ll be playing for years to come. This summer is Splatoon 2‘s for the taking, Nintendo building on their refreshingly original idea to produce a sequel that makes improvements across the board. It won’t take long for the game’s tentacles to wrap around you, gleefully inking your turf for hours on end. With Li’l Judd lifting a flag to indicate the victor, Splatoon 2 presents a clear win for Nintendo.